We went at the weekend to see the Elisabeth Frink at Hauser & Wirth in Bruton, Somerset. It is a wonderful show, and the work seemed so at home in the beautiful spaces at Hauser and Wirth. I think that there was something about the quality of the thin winter morning light that made the show really resonate for me. Much of the exhibition focuses on Frink's earlier work, and I loved the nuanced feel of these pieces - smaller and less monolithic than her later work but for me with a subtlety and fragility that was totally compelling. 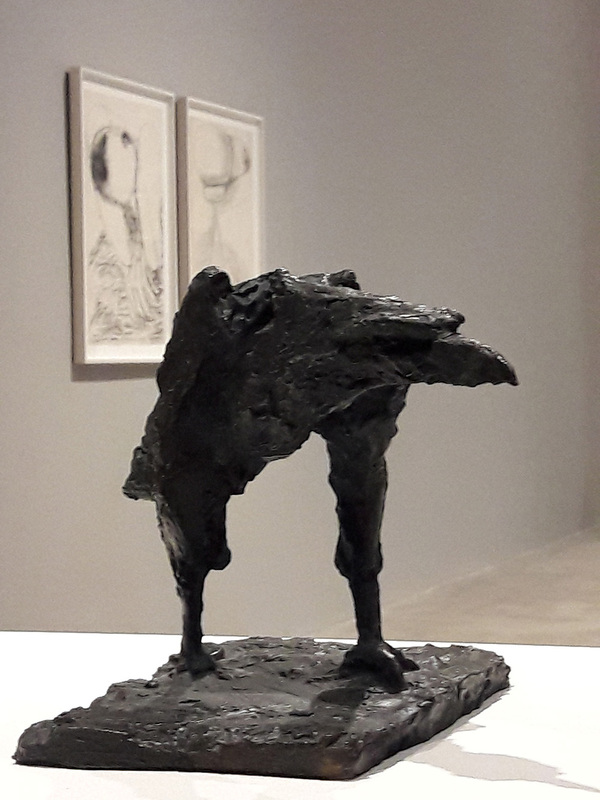 The first large gallery includes a number of these bird-like walking and standing figures. Like a mismatched flock of the wounded and damaged they have an eerie disturbing presence. There was also a series of animal skulls or fossils - fragments of horses. Again there was a fragility and an anguish about them that was profound. Reading about Frink's life and preoccupations, it is easy to see in the work her childhood memories of the second world war (heightened by growing up near an airfield); and a preoccupation with the looming menace of the cold war. Alongside the bronzes are a series of drawings - large scale pieces in charcoal, ink and pastel. I particularly liked the one of the falling/ lying figure below. I have seen many enjoyable and absorbing shows over the last few years, but is a long time since I have found one so moving.